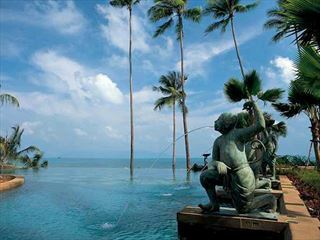 Now known as the Centara Grand Beach Resort Samui. 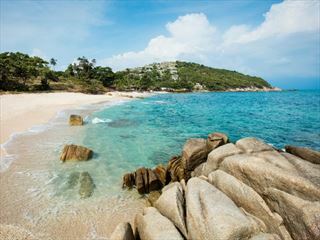 Superbly located along Chaweng, Koh Samui’s finest beach. 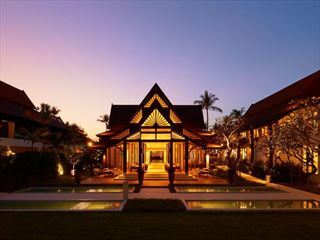 Central Samui Beach Resort offers first class Thai hospitality. Enjoy the exceptional facilities of this award winning deluxe resort which combines the spirit and culture of the island with a tranquil ambiance and sheer beauty. A choice destination for lovers of water sports in particular and everyone in general. All rooms have multi-channel satellite television, in-room movies, music channels, mini-bar, tea and coffee making facilities and safe. The Club level accommodations offer exclusive lounge and services. Deluxe rooms are sea-facing with king/twin beds, spacious bathroom, hairdryer, bathrobes and slippers. Deluxe Pool Suites offer a large living space together with a private courtyard complete with plunge pool, lounging and dining areas. An oversized signature king bed with a double sofa bed as standard. Luxury bathroom features bathtub and shower, hairdryer, bathrobes, and slippers. The Club lounge and benefits are also included. One Bedroom Suites have a separate bedroom with king bed and large living room with dining table, large spacious bathroom, hairdryer, bathrobes and slippers. One Bedroom Premium Deluxe Pool Suites provide a separate bedroom and large living and dining room with a large private courtyard complete with plunge pool lounging and dinning area. An oversized signature king bed is standard. Luxury bathroom features bathtub and shower, hairdryer, bathrobes, and slippers. The Club lounge and benefits are included. The Palm Grove is open morning to night, serving a wide variety of Western & Asian cuisine. Spice Island offers traditional Thai Food in a superb beachside dining venue. The Dip & Sip swim-up pool bar serves juices, cocktails and beers are served at your beach chair, or at the bar counter. The Seabreeze Beach Bar & Terrace is an ideal place to refresh with snacks & beverages throughout the day and early evening. The extensive a-la-carte menu of Hagi is complimented by fresh seasonal ingredients, resulting in Samui’s finest Japanese Restaurant. Surfers is a lounge where guests can surf the web and send their emails. Drinks are available, as well as a large screen TV featuring major sports events. Zico’s Braziian Grill & Bar serves succulent grilled meat and fish, live Brazillian music and entertainment in a vibrant bar atmosphere; for a tantalizingly different meal experience.